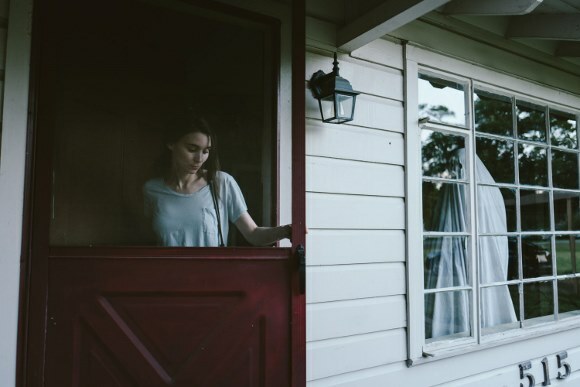 The characters – and at the beginning they are characters, people we feel like we are getting to know (but that dissolves into an eternal life as people change but time keeps moving on) – are husband and wife played by Casey Affleck and Rooney Mara. They live in a small, slightly run-down single-family home and they are planning a move into a condo building. Wife is way more interested in planning the details of the move than Husband; as Casey Affleck is prone to playing, the husband is a little more aloof, disinterested and slightly morose. But soon he dies, and then he is just a man in a white sheet – the ghost. The most remarkable aspect of A Ghost Story is that I never felt like that was Casey Affleck wearing a white sheet over his head. I was watching a ghost, experiencing what he was experiencing, feeling what he was feeling. It needs to be pointed out that the film is very slow-moving, so slow that many scenes are literally not moving, but it never drags – in fact, it ended much earlier than I was prepared for it to end. The ghost is very engaging. The cinematography makes it very clear what his observations are, but the impressive part is that it also makes it clear what his thoughts and emotions are despite never saying a word, despite the audience never seeing a face or eyes, but just a white sheet with two holes cut out. There is a lot to reflect on in this film – like what memories is the ghost carrying with him? What is drawing him to this house – is it the house? How can I comfort the ghost? The loneliness, fear and anger at change that the ghost experienced was incredibly palpable. Ultimately, it’s a film about the nature of life and loss, but with a lead character you have never seen before - one that will stay with you for a long, long time, perhaps eternity.